The second largest city in Switzerland, Geneva enjoys a stunning location at the western end of Lake Geneva and is the economic centre of the region. Numerous international businesses and important associations have chosen this Swiss city for their headquarters. Geneva offers tourists a unique insight into the history of the region, and is the ideal choice for those who like to keep active in their free time. The old town is the perfect place to start your trip around the city with its historical buildings, towering architecture, and lively restaurants. What’s more? Outside the city limits, visitors will find a great variety of outdoor activities. The city of Geneva is home to many attractions, all of which can be easily discovered with a rental car. With Driveboo, you can compare different car rental offers and book your rental car directly online. Where is it best to rent a car in Geneva? Geneva offers a plethora of options when it comes to car hire companies. However, if you are planning on arriving by plane, you can take the advantage of one of the car rental companies located at the airport. Visiting Geneva is extremely convenient as the city possesses its own airport, namely Geneva Airport (GVA), which is located just 6.4 km from the city centre. With a rental car, Geneva will be the ideal starting point for your exploration of the whole region. When driving in Switzerland, your driver’s licence must be in one of the official languages of the country. When it comes to car rental, you will also need to carry your rental agreement with you. It’s important to remember that Switzerland requires drivers to have a minimum of third party cover while driving around the country. Most car hire companies offer a wide variety of insurance types so you should not have any problem finding appropriate cover for your vehicle. Drivers have to give way to public transportation. You have to switch off the engine of your vehicle at traffic lights as well as at railway level crossings. In the winter season, it is mandatory to have winter tyres. In Switzerland, driving with dipped headlights is compulsory. Are there any toll roads in Switzerland? All motorways across Switzerland are toll roads. Visitors can purchase a motorway pass for CHF 40. These are available at service stations, customs entry points, and post offices. You should place your pass on the inside of your windscreen or else you will be subject to a fine. 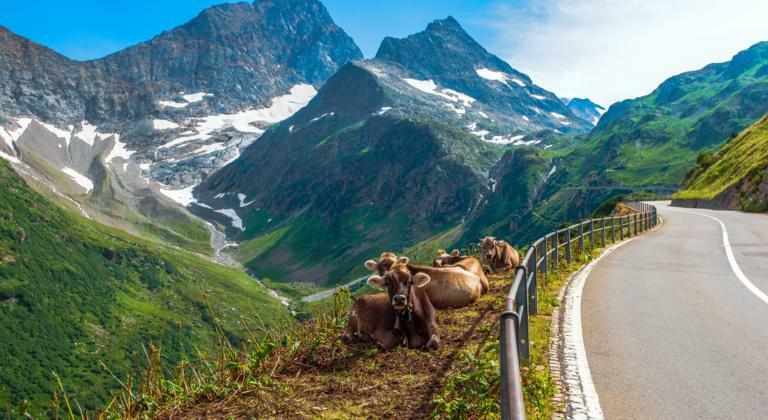 What are the speed limits for cars in Switzerland? What is the permissible level of alcohol content in Switzerland? The permissible level of alcohol content in a driver’s blood is 0.05%. For all types of emergency, you should call 112. You can also use 117 for the police, 144 for the ambulance service, and 118 for the fire department. Geneva offers a wide variety of tourist attractions, both inside and outside its city limits. Renting a car is the most convenient way to visit most of the interesting spots. The Old Town of Geneva is the ideal place to start your journey around the city. It is located on a scenic hillside, giving you a unique opportunity to admire the nearby lake. The heart of the city is the perfect starting point for a tour around the most important historical monuments, fortifications, and restaurants. You can also start your trip from Place du Bourg-de-Four, which is considered to be one of the most scenic places around the Old Town. The oldest square in the city offers a great insight into Geneva’s architecture and cultural heritage. One of the most important tourist attractions in Geneva is the Temple de Saint-Pierre, which dates back to the first half of the 12th century. The architectural details of this building are characteristic of the Romanesque style. The temple played an important role in the Protestant Reformation. Jet d’Eau, or the Water Jet, can be found in Geneva’s harbour. The jet is a great attraction for families with children in particular. The water from the jet soars as high as 145 metres above the lake’s surface. It is considered to be one of the city’s most famous symbols. Another notable city highlight is the Palais des Nations, which is also the headquarters of the United Nations. Perhaps the most important part of the building is the Assembly Hall that is used for meetings of the organisation. After a long journey around the most notable highlights of the city, you should definitely head for the surrounding region. Your rental car will enable you to explore all of the nearby attractions.